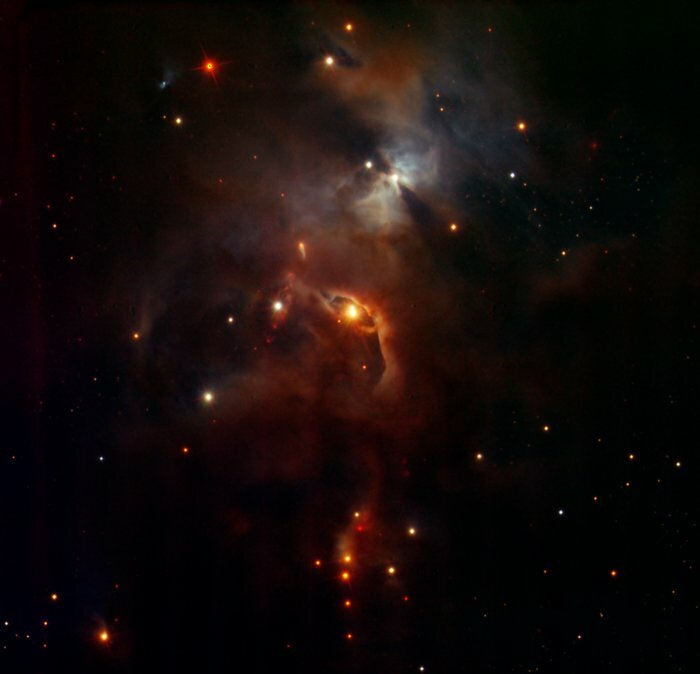 The Serpens Nebula, located in the tail of the Serpent (Serpens Cauda) about 1300 light-years away, is a reflection nebula that owes most of its sheen to the light emitted by stars like HBC 672 — a young star nestled in its dusty folds. 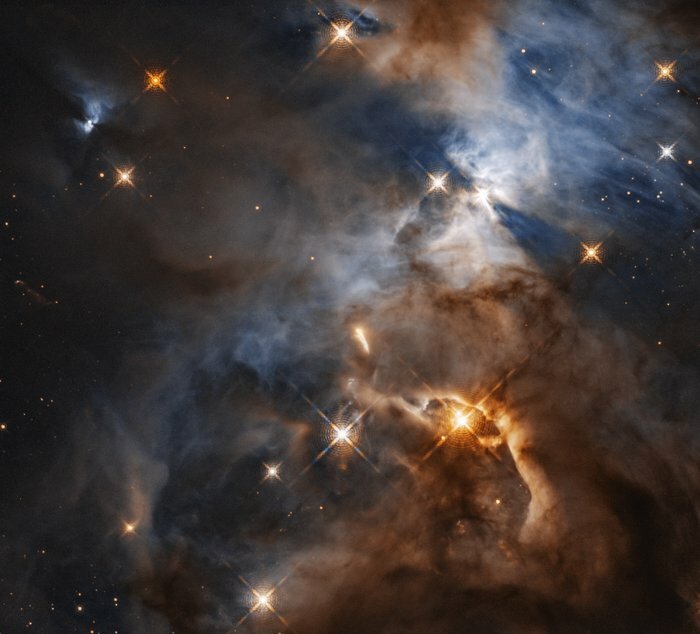 In this image the NASA/ESA Hubble Space Telescope has exposed two vast cone-like shadows emanating from HBC 672. These colossal shadows on the Serpens Nebula are cast by the protoplanetary disc surrounding HBC 672. By clinging tightly to the star the disc creates an imposing shadow, much larger than the disc — approximately 200 times the diameter of our own Solar System. The disc’s shadow is similar to that produced by a cylindrical lamp shade. Light escapes from the top and bottom of the shade, but along its circumference, dark cones of shadow form. The disc itself is so small and far away from Earth that not even Hubble can detect it encircling its host star. However, the shadow feature — nicknamed the Bat Shadow — reveals details of the disc’s shape and nature. The presence of a shadow implies that the disc is being viewed nearly edge-on. This video pans over NASA/ESA Hubble Space Telescope observations of the Serpens Nebula, about 1300 light-years from Earth. It is a reflection nebula that owes most of its sheen to the light emitted by stars in its surroundings or embedded within it. It is also home to two cosmic shadows, created by stars which are orbited by protoplanetary discs.